Forever-Flow design allows for a continuous water flow. 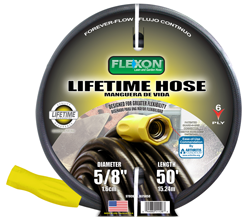 Flexon’s patented Guard-N-Grip connector protects the hose coupling from becoming damaged while making it easier to connect and disconnect the hose from any faucet or spigot! Crush-Proof Brass Couplings. 6-Ply Construction: 2-Ply Reinforcing, 2-Ply Inner Core, and 2-Ply Outer Jacket.